Needles were packed in the tins in a small paper packaging, mostly black, on which following was mentioned: « Use each point once only ». This was necessary to avoid that the steel point, by blunting, damages the groove of the record. Knowing that a 78rpm side would last about 3 minutes, you always had to have a gramophone needles tin ready to use to be able to listen regularly to music. This means that needles tins belonged to the running equipment of a household as soon as a gramophone had entered the house. Tins’ content was mostly of 200 needles, or of 100 needles in thinner tins. 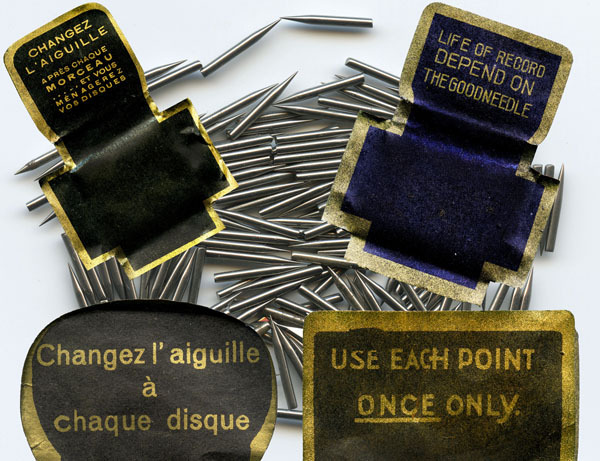 But you could find tins with only 50 needles, or with 150, 300, 500, 1000 or even 10000 needles. During the few decades of boom of gramophone – from the late 19th Century to World War Two –, it is certainly millions of needles which were produced, and hundreds of thousands of tins. Moreover, the production of needles went on still years after the end of production of gramophones, the demand remaining pretty strong. Factory Bohin, in France, for instance, produces needles even nowadays. This is not really surprising : to play 78rpm records on the ancient gramophones, it is still highly recommended to "use each point once only"!